Currently I have tons of work to do online. I have tons of priority work online and because of that my fingers are complaining. Two weeks ago I mentioned in my post about my fingers are super stressed and needs a rest that I also posted there the photo of the dry chapped skin of my fingers. I love to work, enjoy doing multitasking and super like my online work. Personally I am not complaining with the tons of work online because I consider it blessing but I can’t hide myself that my fingers are the one’s stressed. I am just waiting for another blessing to come and that is to have a very nice helpful house helper. I still don’t have a House helper so I multitask at home working online, doing household chores and taking care of my little boy and his daddy. 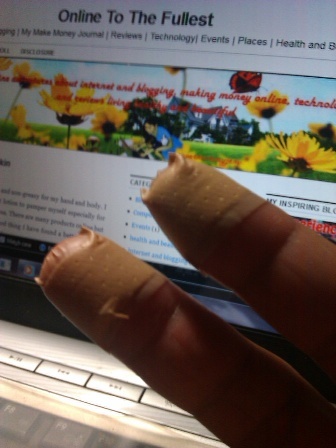 This entry was posted in Internet and blogging and tagged fingers with band aid, workaholic fingers. Bookmark the permalink. Wew! you are endeed have a workaholic fingers. I think you must rest that fingers ´so that you can have another energy to work online again :).. Same here..parang napapasma na nga yata kamay ko eh. My fingers need some rest too.